By simply taking on basic tasks a month attending to your HVAC system, you can save money on repair costs. Even if you’re not a handyman, you don’t have to be intimidated by the thought of taking some HVAC maintenance steps. Marsh Heating and Air Conditioning is your friendly HVAC company in Ramsey MN that offers professional maintenance of any HVAC system. Here are easy tips that even untrained homeowners can do to help reduce HVAC repair costs. Since the temperatures are much milder in the spring, this is a great time for you to have your HVAC systems maintained. 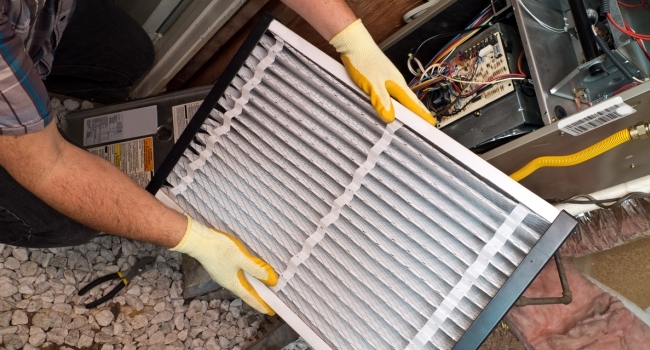 Your furnace can finally take a break from working like a horse last winter. On the other hand, your air conditioner is about to make another stretch of hard work in the weeks to come. Of course, you want to make sure your home is at just the right comfort levels. Marsh Heating and Air Conditioning is your trusted HVAC company in Burnsville MN that can help you properly maintain your heating and cooling systems, keeping them at peak performance year-round. Here are some spring preventive maintenance tips you might want to consider. We live in a generation where homes are built not only to become more energy-efficient but also smarter. As you look for ways on how to improve your comfort and your HVAC systems’ efficiency, you simply can’t ignore smart thermostats. These devices are designed to make your life more comfortable and yes, smarter. There is a myriad of smart thermostats available on the market today, but how do you pick the right one? Marsh Heating and Air Conditioning is a leading HVAC company in New Brighton MN that can help you find the smart thermostat for your needs. We offer a wide variety of smart thermostats, made by the best in the industry. Because of extreme weather, a typical American home has a furnace to heat the house in the winter, and an air conditioner to cool it down in the summer. While running an HVAC system ensures comfort for you and your family, but it doesn’t guarantee an effective elimination of airborne pollutants. This is especially true if your home is constructed to become energy-efficient. Newer homes are sealed as tightly as possible, leaving no space for contaminated indoor air to get out. Marsh Heating and Air Conditioning is a leading HVAC company in Crystal MN that offers home comfort products, including high-efficiency HVAC filters. Spring is finally here. During this time of year, your home can suffer from the changing weather, which can be a problem if you’re trying to keep a consistent indoor temperature. One of the issues this season brings is the growth of pollens in the air that triggers or worsens asthma and other respiratory diseases. While you can’t really control your outdoor environment, you can actually protect your indoor environment with the use of a good ventilation system. This HVAC equipment gently flushes these contaminants away from home and keeping them from getting indoors. This system will help you eliminate the stale, damp air and keep your home drier and healthier. One fact that most homeowners are unaware of: when it comes to HVAC systems, bigger isn’t always better. They think that since bigger HVAC systems are more capable in terms of power, they can provide the best possible heating and cooling. On the other hand, there are also those who think small sized systems are more economical because they supposedly use less power. If you’re someone who’s okay with paying high utility costs, diminished HVAC system life, or having a technician frequently visit your home, then it should be all right. But if you’re a prudent person who wants to get the most out of your furnace or air conditioner, read on and find out the advantages of having a system that is properly sized for your home. HVAC systems don’t last forever. At some point, your unit will show signs of deterioration and cause you to spend more to keep it running. If you have been using your furnace or air conditioner for the last 15 years or so, you may notice a constant hike in your heating bills and more frequent need for repairs. This is a clear cut sign that you will need to look for a new system sooner than later. Why Should I Get the Dave Lennox Elite® Series XP20 Heat Pump? Heat pumps offer a myriad of benefits to both homeowners and the environment. That is why they have been increasing in popularity over the past few years. These systems can be used to heat or cool space through radiators, air convectors, and underfloor heating systems, and can also be used to heat water for general use in your home. A heat pump is also economical to operate because it uses less energy. Typically, heat pumps can be 2 to 4 times more efficient than other HVAC systems like air conditioners, furnaces, and water heaters. This fuel efficiency results in a lower carbon footprint, which is what the environment needs today. Having a professional maintain your HVAC system at least once a year is more than just a task; it’s an essential part of keeping your equipment in optimum condition. While some homeowners think about their furnace or air conditioner when it breaks down, but once you learn the importance of yearly system maintenance, you’ll never disregard it again. Marsh Heating and Air Conditioning is your reliable HVAC company in Champlin MN that has the experience and knowledge to properly maintain your HVAC systems. Marsh Heating and Air Conditioning is a leading HVAC company in Brooklyn Center MN that works with Lennox Industries to offer you energy-efficient heat pumps created to heat or cool certain areas in your home.